In case you haven’t heard, it’s FIBERuary here in Western Massachusetts! Carole Adams, of Whispering Pines Fiber and Herb Farm in Colrain, came up with the idea as a way to promote local fiber farmers. She was inspired by an initiative in the UK called Wovember which encouraged people to think more deeply about where wool comes from, to celebrate the incredible diversity of British wool, to wear 100% woolen garments, and to knit with British wool. Around have we a lot of local shepherds who raise lovely fleeces from a variety of breeds, everything from Cormo (fine and soft) to Leicester longwool (durable and lustrous). FIBERuary is not limited to promoting wool, however. Fiber farmers around here have a lot of different animals, including alpaca, llama, angora rabbit, angora goat (where mohair comes from), and pygora goats (who can grow a fiber similar to cashmere). In addition to animal fiber, there are a few of us growing flax in the hopes that this amazing plant fiber can play a role in a more local, sustainable approach to textiles in North America. How can you celebrate FIBERuary? One way is to read the FIBERuary blog that Carole set up for the month of February. She plans to have guest writers sharing their stories and experiences almost every day this month, including local fiber farmers and fiber artists. 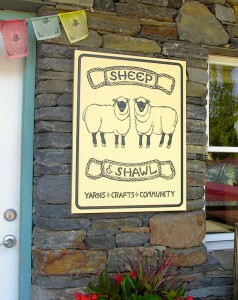 Another way to celebrate FIBERuary is to come to Sheep and Shawl in Deerfield each Sunday afternoon from 1-3pm. Liz Sorenson is hosting a series of speakers at her shop. Alas, you have already missed Carole Adam’s talk on February 7th, “Stories from the Farm.” She shared many funny and sweet stories yesterday from her years living with and caring for sheep, llama, and chickens, along with some cautionary tales about wool moths, skirting your fleeces, and neighborhood dogs. Feb 14 – Panel of Fiber Farmers – Hilary Woodcock, alpacas; Chris Pellerin, Pygora goats; Jenny Atkins, angora rabbits. And while you’re there, you can buy some local wool from Liz’s consignment vendors and do some local knitting, felting, crochet, or weaving!